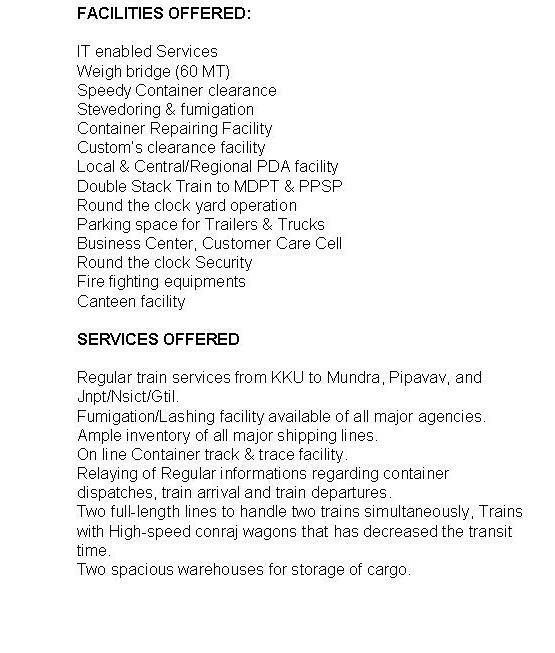 ICD/KKU a flagship ICD of Container Corporation of India Ltd. A Govt. of India Undertaking Under Ministry of Railways has always been a front leader in setting up new standards. Inland container depot offers its best services for EXIM & DSO Movements from Kanakpura-Jaipur with its state of the art equipments and is one of the biggest Inland Container Depot in Rajas than. CONCOR KKU created history in India by running the India’s first and Asia’s second Double stack train from Jaipur to Pipavav port in March 2006 with 180 Teu’s on it. Since then double stack trains have been constantly run between KKU-Mundra & KKU- Pipavav and back. Authority Name & Address Contact No.